And then take a moment to check out the documentary by Dalton Runberg which provides insight into the techniques behind the film. OK, so today I spent the entire day inside waiting for the cable guy and on conference calls. Cabin fever strikes again. So I have realized a couple of solutions to deal with being stuck inside and unable to fish. I’m definitely going to at least go hiking…there’s nothing stopping that and I have the right gear, even for the cold weather. I’m also going to start studying for the coming 2012 hunting season. I’ve signed up for my NY Hunter Safety and Bow Hunter courses next month in the Bronx. If you’re interested in such a course, go here, they’re free. Oddly enough, the classes I’m taking are being taught at the MLK Jr. Center for Chemical Dependence Outpatient Services. Weird right? But here’s my BIG IDEA! Why not ask you, my reader? To that end I want to announce deadbait’s first reader poll. Here’s the deal–if you’re an angler or hunter or general outdoors-oriented person, share with me your BEST solution for fighting winter cabin fever right in the comments section of this blog post. I will publish the top 10 solutions (I will pick them) in a later blog post and the top 3 will win one of the prizes below. 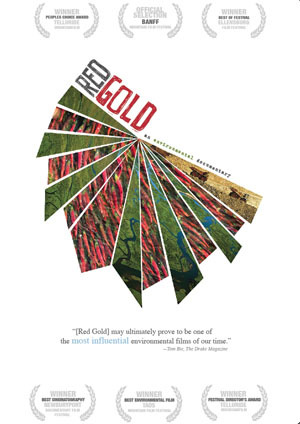 Red Gold DVD of the hit conservation and angling film that documents the devastating effect mining could have on Bristol Bay, something I’ve written about in-depth before. Its still in the shrink wrap (I’ve seen the film before). 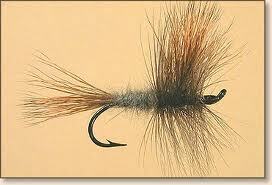 3-pack of hand-tied Grey Wulff flies tied by the reknowned outfitter and fly-tier Bob Jacklin. I won a bunch of flies during a NYC TU raffle and want to share the love. You’ll get a #10, #12, and #14 grey wulff I SWEAR by the provenance of these. Jacklin’s Fly Shop in West Yellowstone, MT is well-known. Don’t worry I’ve got 7 more in each pattern for my OWN collection. I plan on mounting three and fishing the rest. Afterall, what is a fly that hasn’t been fished? Useless that’s what. 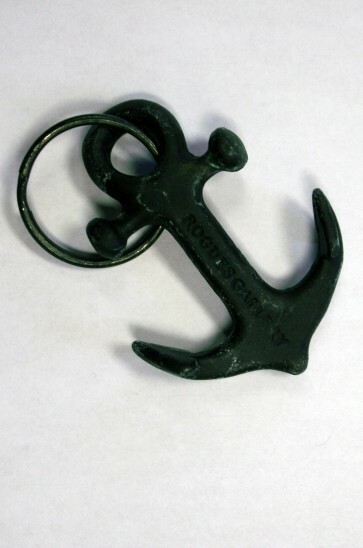 Rogue’s Gallery Anchor keychain by designer Alex Carlton, founder of Rogue’s Gallery in Portland, Maine and also the designer of the L.L. Bean Signature line. These are pretty hard to find. I bought this for myself but then my girl got me a Makr keychain I prefer. If you figure it out, its also a handy bottle-opener. There will be 3 prize winners. First prize winner gets first pick out of the following three prizes, second prize winner gets second pick. This is an informal “poll” so no monkey business. Deadline is Feb. 15th, midnight and I will only ship in the US. One submission please only. When you post, please “follow” this blog so I can contact you later. Yes, people might see your idea and try to top it–that’s the point, but if you’ve read my blog or my tumblr blog before you know a little about what makes me tick. I just want to know what YOU do break out of your cabin fever. I haven’t fished in weeks and I’m going stir-crazy. I’ve begun to watch the thermometer like a crackhead. When the temp goes up just a few degrees, I break into a sweat and wonder if I should get out on the water. But then, the question is where?! Its an hour and a half drive to the only open tailwater, the East Branch, and the temps up there are typically 5 to 10 degrees cooler than the city, so it doesn’t do much good. Plus I hear the trout have lockjaw there. The LI sound is also a ghost town with striper season being over and the blues out deep in warmer water. Lord knows I ain’t going herring fishing with a sebiki. I even thought about hitting a party boat for Cod off Block Island, but frankly, that kind of fishing just isn’t me. Of course, most guys are inside tying flies when they can, but I don’t tie, I might some day, but just don’t want to get sucked down that rabbit-hole right now. I’ve been considering going south to visit family in VA and I hear the streams are in good condition with regular hatches still going on. Might have to schedule a road trip. Maybe I can turn this thing around? Does cabin fever really have to be a BAD THING? I recently found some very inspiring portable cabins, designed for living a small life with a tiny footprint, designed for exploration and portability. I might have to upgrade from the Prius. 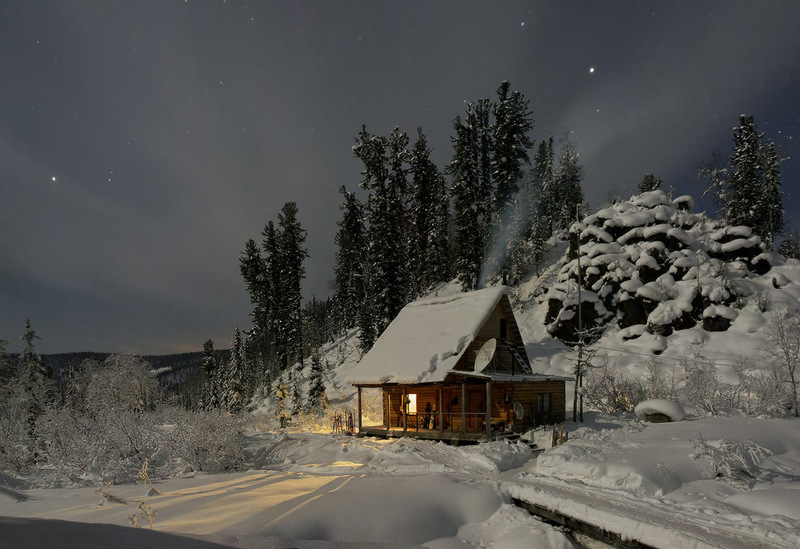 Check out the tiny house on wheels designed by Outdoor Research, so several ski-bums could explore the back country out west, documented in the Side Country Sessions. I also like this project by Andy Stewart who lives in his trailer with his dog. 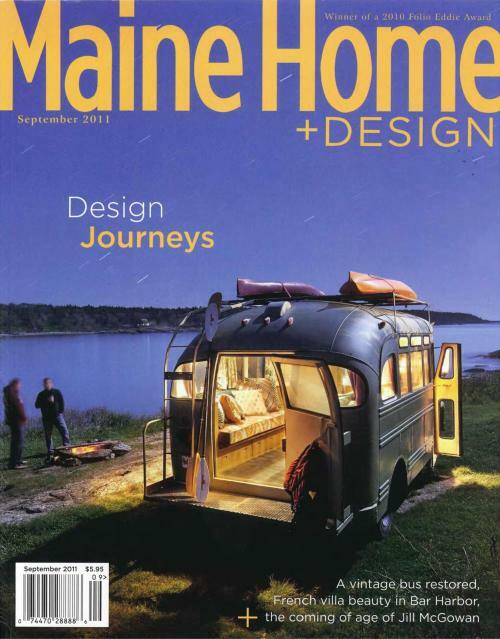 Stewart is a sailor and his trailer is homebase for many excursions, like his row/sail trip on the Maine Trail. This project by Linekin Bay Woodworkers has received quite alot of attention, but may be new to you. They transformed a 1959 Chevrolet Short Bus into a motorhome. There’s a great blog post at N’East Style about the project. The master woodworker is the blogger’s boyfriend’s dad and she’s got a nice take on it–she’s also a fantastic designer so check her work out. Well, so I’ve decided what I want for my 50th birthday. Since my wife is an architect, I want her and I to collaborate on the design and build of the perfect cabin or maybe a motorhome. Growing-up, my older brother wanted to be a marine biologist, in part inspired by watching quite a few Jacque Cousteau documentaries. My bro became a doctor but I hope will get PADI certified still someday. For the dream deferred, I recommend the new Cousteau Collection app for the iPad/iPod. The app is free, but has a bit of gamification to encourage you to buy stickers that unlock more content. Stickers can be traded and enable participation in “global jackpots” (contests?). 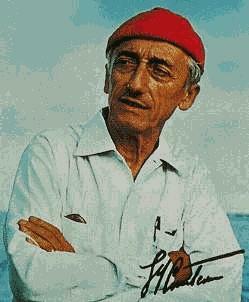 The Cousteau Collection as an app is a brilliant way to access the Cousteau family’s research, films, and adventures. It also contains films made by divers in the Cousteau Divers community, a new non-profit in-beta that brings together divers around the world into participant-science projects. Divers receive some basic training and then can do simple missions where they record conditions in their local waters. The course materials are inexpensive–you can even buy a trademark Cousteau “red cap.” 65% of proceeds of the trading stickers goes to Cousteau Divers. The sticker game can also be played as a Facebook app. Its pretty simple–you collect stickers, trade, and then place them in your album. I could see this being the perfect project for a middle-school class or enthusiastic fan. I know I’ll be downloading some film and catching up with the original warrior for the seas. If the weather is fine, on Friday in the early, early AM, I plan to wade and sight-fish for snook in the Passes (the inlets of two national parks). 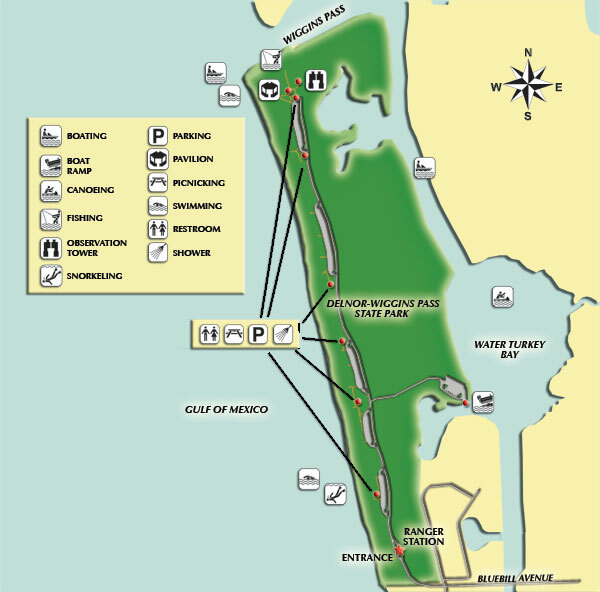 The Delnor Wiggins Pass State park is conveniently right in Naples and is the pass on the north end of the island, a natural outlet for the Cocohatchee River. On Saturday, the plan is to do a guided trip for Tarpon. By March, the Tarpon should be migrating through the 10K islands area and I’ll rely on my guide to lead us to them. I hear they can be seen in the thousands and are typically in the 80 – 100lb weight class. That being said, I’m almost willing to pass up the Tarpon for a world-class in-shore guided sight-fishing for trophy snook, from Capt. Jeff Legutki. If Sat goes over well, I might extend ourselves to a second day of tarpon fishing on the fly Sunday. If we get our fill or the weather bottoms out or my wife needs “my presence”, then I’ll head to the other “Passes” in Naples, either Clam Pass or Gordon’s Pass for more wade fishing for jack, snook, or what have you. I may use a guide for this “inshore” fishing because frankly, I’m a bit weary of gators. Clam Pass is the most remote beach, requiring a mile long walk on foot (or trolley) through a mangrove forest to the beach. There’s a retired Mainer down in Naples who guides the Passes on foot I’m looking into. Monday AM I’ll get another walk-and-stalk in at whatever Pass produced best over the weekend. My last trip to FL was a complete bust due to a hurricane and while I did manage some light wading and great practice casting, I was stymied. I’ve got a special no-rain dance and prayer session planned for this trip to Naples. Animals will be sacrificed. Its MLK weekend, and once again, the U.S. National Parks will be offering free access to hundreds of parks nationwide to commemorate the Rev. King. Several park sites are directly associated with King’s legacy, including the Lincoln Memorial in DC, the MLK Historic Site (birth home) in Georgia and the Selma to Montgomery Historic Trail. If you’re in NYC, now’s a good time to visit the African Slave Burial Grounds in lower Manhattan. If you’re in or near Yosemite, the Buffalo Solider interpretation program is second-to-none and you can get some fly fishing in on the Mercd river for wild ‘bows. If I had to do it over again, I’d be either a Ranger for the US Fish and Wildlife or US Park Service or a fly fishing guide…hmm, there’s still plenty of time. The name L.L. Bean evokes in me familiar sensations that stir my senses. I can smell oiled leather and dirt, the scent of crushed leaves on a dry breeze. I can feel the heft of canvas and the sticky rubbery knobs in my hand, along with the back and forth motion of lacing up a boot. Ah, the secure feeling of a well-laced boot. I can hear the sharp, zippy noise of a thorn vine sliding off waxed cloth and the crash and snap of twigs below my feet. I can see across the stream over the sun-dappled surface and into the shade below the overhanging willows and spot the bluegills slurping bugs off the surface. Yep, to me, Bean is synonmous with the outdoors and ever since I had my first pair of duckboots (I think I was about six or seven), it’ll be synonymous with splashing in puddles. Over the years, I’ve drifted to many outdoor brands, but L.L. Bean remains the original to me. Somehow it was always affordable for my family, always available and ever-present, especially in the New Hampshire countryside where I was born. Frankly, there was nothing else. Imagine my surprise to learn that L.L. Bean is celebrating its 100th year in 2012. In the years after college, I’d become petulant about certain American brands. Fortunately, we’re not doomed to the ignorance of youth and things change, and now I’ve fallen for L.L. Bean all over again. Sure they don’t make everything here in the states–and who could afford to these days–but they do their best, and they continue to make the outdoorwear pretty accessible. I’ve lately been messing around with some of their fly fishing gear and accessories, but I didn’t realize that old L.L. himself was an avid fly fisherman, and a devotee to the bamboo rod. For the 100th Anniversary, Bean has created a special bamboo rod with Thomas Rod Company in Brewer, Maine. Its a beaut. Oh its way beyond my means for sure, but 100 year anniversary’s don’t come along every day. Someone will give the 25 individually-numbered limited edition rods a good home, I’m certain. Happy Anniversary L.L. Bean–here’s to 1oo more! Some excellent work from the boys at Felt Sole Media on one of my favorite movements by Patagonia founder Yvon Chouinard. I can’t wait to join 1%. I love my pop. He has a knack for giving surprising gifts, sometimes spot-on, sometimes hilariously odd. He once got me a popcorn maker, one of those old-timey miniature red ones you’d see in a vintage cinema. 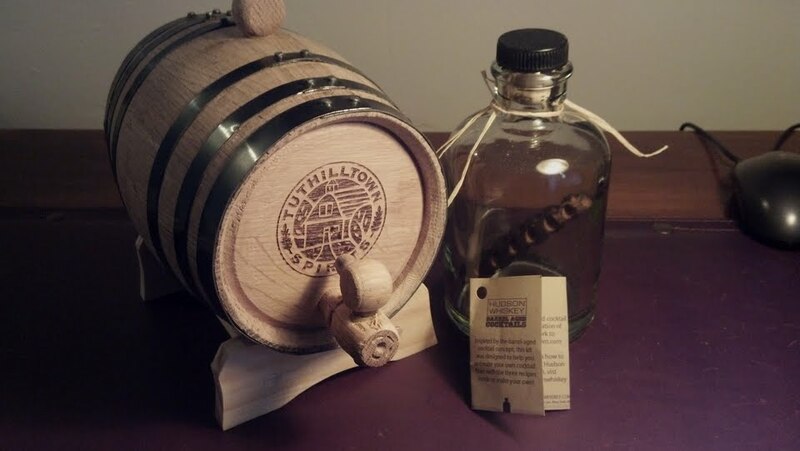 This Christmas, he hit the nail on the head with a Barrel Aged Cocktail Kit, including bottle with oak stave and custom made 1 liter barrel from Tuthilltown Spirits. Call me trendy but damn that’s nice! Tuthilltown has been supplying quite a few NY-area bars with their oak barrels I hear, and I’m pretty certain the Aged Gin Breukelen Distilleries produces is done in T-town barrels. Can’t wait to have him up from Richmond so he can sample my aged Manhattan. I’m also considering a single-malt aged-cocktail so if you have any ideas, drop me a line.